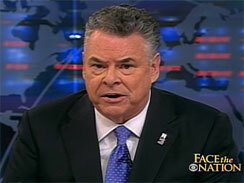 Hooray for Congressman Peter King (R-NY) for his praise of the Obama administration’s handling of the attempted bombings of FedEx and UPS cargo planes last week. In contrast to recent shameful attempts by many Republicans, most prominently Rudy Giuliani, to politicize the ongoing battle with Al Qaeda, King passed up the chance to make hay on election eve over the issue. No equivocation, no hint that Republicans could have done it better, no nudge to vote Republican tomorrow. Just praise for federal workers doing their important jobs right. Reinhold Niebuhr would have applauded King’s contribution to “the temper and integrity of the political fight. This entry was posted on November 1, 2010 at 1:14 pm and is filed under Ethics-general, Government, Politics. You can follow any responses to this entry through the RSS 2.0 feed. You can leave a response, or trackback from your own site.